Alfred White first met Peter Poppe in August 1897 when visiting a small arms factory in Austria. They became friends, and White suggested to Poppe that he moved to Coventry to set up an engine business. Supported financially by White’s family, the resulting Company was registered in 1899. White’s family owned 337 shares in the company, Alfred White, 250, and Peter Poppe, 1 share. The company initially worked on the design of a single cylinder engine but this was interrupted by manufacture of munitions for the Boer war (1899-1902). The first engine produced was for a motor bike in 1903 (80mm bore 85mm stroke, air cooled). In 1905 they introduced a 80mm bore 90 mm stroke engine in 2, 3 and 4 cylinder versions (7-14 hp). In 1900, White and Poppe filed various patents for machine tools they had designed for their production line. They pioneered interchangeability of parts in automotive engines from their experience in the munitions industry. Their advanced carburettors mechanically controlled the proportion of fuel to air to achieve a consistent proportion throughout the operating range. When the first German airship was shot down (Schutte-Lanz SL11) on 3rd September 1916 it was fitted with a White and Poppe carburettor. 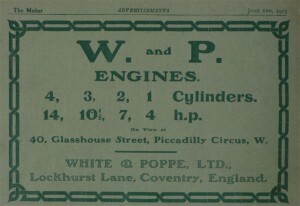 White and Poppe were a proprietary engine manufacturer and became a preferred supplier to Dennis Bros in 1906 at which point White and Poppe were supplying 22 different motor manufacturers. On 5th November 1919, in the post World War I recession, Dennis Bros purchased White and Poppe by exchange of shares to the value of £204,365.00. 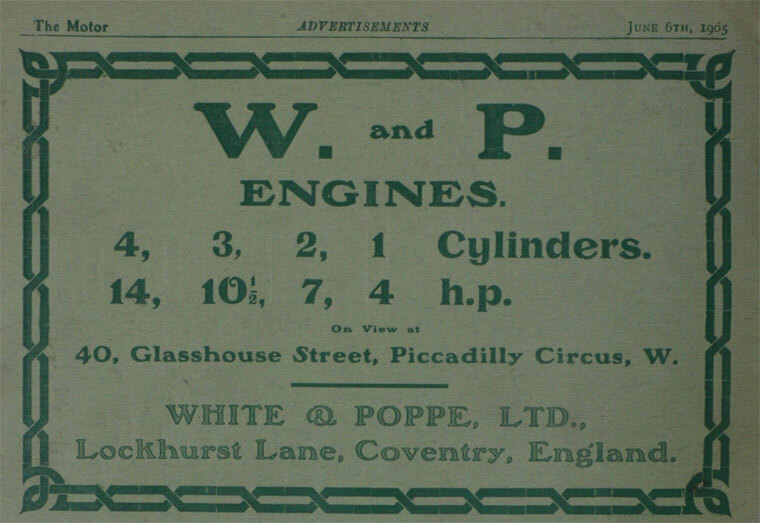 White and Poppe had produced nearly 12,000 engines in total, including ca. 5,000 for Dennis Bros.
Alfred White was offered a knighthood after World War I but turned it down because Peter Poppe was not eligible, being a foreign national. Dennis produced their first fire engine in 1908, it was fitted with a four cylinder White and Poppe engine. The engine was of 127mm bore by 130mm stroke with the four cylinders cast separately. The valves were driven off two camshafts, one placed on either side of the crankshaft, the cams had roller followers so they were not highly stressed despite the size of the engine. Cooling water was pumped by a centrifugal pump that forced water to flow over the top of the water jacket in each of the cylinder blocks. The engine was fitted with a White and Poppe carburettor. Scoops operating in troughs in the sump lubricated the big end bearings. No. 1 main bearing was pressure fed by the pump, and used a cross drilling in the crankshaft to distribute oil to the four other main bearings, these had troughs above them from which oil ran under gravity onto the bearings. The engine ran on a magneto, but was started on a trembler coil (which could also be used to run on should it have to). The engine delivered around 50hp, an adequate amount, but it was not enough to drive the Gwynne pump to it’s full capacity. For this reason in the same year the six cylinder White and Poppe engine was also an option. This was of an identical design, just with two extra cylinders, and offering around 75hp. In 1912 Dennis also offered the 60hp White and Poppe engine, this had a five inch bore and a seven inch stroke, with cylinders cast in pairs. Being of the same basic design virtually nothing else changed with the introduction of this modification. By 1916 oil-deflecting ridges had been cast into the sumps in order to improve the oil collection in the big end troughs, probably as a result of problems with the more heavily loaded big end bearings in the 60hp engine. By 1919 a small pipe had been cast into the oil pump input to allow crud to settle in the bottom of the sump and prevent it being pumped around the engine. The oil strainer was now also allowed a finer mesh, increasing the amount of crud that may have been pumped. A roof had been cast into the sump below No. 3 main bearing so as to improve the lubrication of no 2 and 3 big ends. By 1920 a smaller pair cast White and Poppe engine was introduced. The cylinder blocks were basically scaled down from the 60hp making it 112x150mm, but there had been a number of improvements. The oil was held entirely in the sump so there were no external oil pipes, there were a number of strainers throughout the oil system, and it was possible to fit the engine with an impulse magneto, so there was no need for a trembler coil. By 1920 there had again been changes to the oil system of the 60hp engine, the oil was now distributed by the drilled exhaust camshaft, eliminating a great deal of external oil pipes and the additional roofs had been cast into the sump below No. 2 and 4 main bearings so that all the main bearing overflow was directed to the big end troughs. The 60hp engine was also being fitted with aluminium pistons at this time. By the mid 1920’s the 60hp had also adopted the system of containing oil in the sump. The crankshafts were also balanced, making the engine run more smoothly. The White and Poppe were fitted up until 1931.